Damp proofing injection (also referred to as chemical DPC, chemical injection damp proofing, damp course or coursing) is usually used to treat rising damp in brickwork. The picture left shows a chemical injection DPC installation at the Shrewsbury branch of Barclays Bank a few years ago. 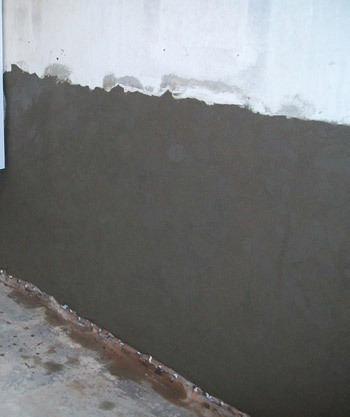 A scientifically engineered damp proofing cream (we use Dryzone Damp Proof Course Injection Cream or more often these days Dryrod DPC damp proofing system) is applied by drilling a series of holes at correct intervals and injecting using a specially designed applicator or, in the case of Dryrods, clean the holes thoroughly and push the Dryrods in to the required depth. With Dryzone and Dryrod systems, the damp proof course product spreads through the brickwork and diffuses through the mortar course before forming a water-repellent resin. Dryrod Damp Proofing Rods are the next generation treatment for rising damp. They provide a higher level of performance than any other rising damp treatment currently available. Dryrods are 12 mm diameter, 180 mm length, fibre rods that contain a powerful water repellent. The patented, and BBA-approved, Dryrod delivery system ensures the correct dose of active ingredient is delivered to the wall every time, permanently eradicating rising damp. In January 2017 Dryrod Damp-Proofing Rods, produced by Safeguard Europe, passed testing by the WTA in Germany. The tests confirm that Dryrods are effective for creating a remedial DPC against capillary absorption in masonry, otherwise known as rising damp in the UK. The WTA, which was established in 1976, is a highly recognised international association of scientists, architects and conservationists. It carries out research, testing and approval of technical practices and materials throughout various countries in Europe. Dryrod Damp-Proofing Rods are now approved by both the BBA and the WTA. Damp proofing injection will only work in certain conditions, and only if applied correctly. Conifer use only the highest quality Dryzone damp proofing products to ensure complete effectiveness against damp. Once the injection is complete the walls may be re-rendered using a 3:1 mix and most importantly with a special admixture such as Renderguard Gold which delivers further water proofing properties along with the ability to hold back the salts in the wall to protect the plaster and any decorative finishes. Alternatively the new range of Dryzone Damp Resistant Plasters may be used in place of the render. These plasters have advantages over the old render method in that they are designed to be breathable, which makes them ideal for old buildings and they can be finished easily with most 'off the shelf' modern plasters. They also have Heritage approval which can make them ideal for buildings of wider importance. If damp chemical DPC injection is not a suitable solution for your property, we will advise more appropriate methods for your situation as part of our damp proofing services. Our company has many years of experience in damp proofing and we are always happy to offer guidance and suggestions, so please feel free to call on our expertise. Conifer provide damp proofing injection DPC in North Wales, Mid Wales, Gwynedd, Powys, Ceredigion, Snowdonia Park, Shropshire, Cheshire, the Midlands, the North of England and wherever we're needed! For a little more information please visit our Dryzone Blog.